YANGON, MYANMAR--(Marketwired - Nov 24, 2017) - Over 50 students graduated from the pioneering class of University of Portsmouth's Bachelor of Engineering in Mechanical Engineering (International) and Bachelor of Engineering in Electronic Engineering (International) programmes at Chindwin College in Yangon, Myanmar this afternoon. The milestone comes just after a year since PSB Academy announced a partnership with Chindwin to deliver the Bachelor degree programmes with the UK university. The programmes have enabled students with relevant Higher National Diplomas (HND) or equivalent qualifications to complete their degree courses over a year. Among the outstanding graduates from the class is 27-year-old Sin Jet Shuang, who chose to pursue higher qualifications in engineering after working as a technician for 6 years. "In the time I've spent completing a HND with Chindwin College, then a degree with UOP, with thanks to Sayar U Tin Latt for the scholarship, I've learnt new methodologies and management skills -- I believe the most important thing now is to apply these skills in constructive ways," says the proud top graduate from Bachelor of Engineering in Electronic Engineering (International), who is now a Quality Assistant at Huawei in Yangon. At 24, the top graduate from Bachelor of Engineering in Mechanical Engineering (International) cohort Htet Nay Linn looks forward to embarking on a career in engineering while he volunteers at the Myanmar Engineering Society (MES), Myanmar's industry association for practicing engineers. "I'm confident of my prospects in the sector, now that I've graduated from one of the most reputed Colleges in Myanmar, with a programme that taps on the expertise from lecturers and tested rigour in curriculum from both Singapore and the UK," says Htet. "The success of this pioneering class of graduates in Myanmar reflects our dedication to strengthening the country's workforce with industry-ready talent that can contribute to its development. With our continued partnership with some of ASEAN's leading educators, we look forward to seeing them build and lead the Myanmar of tomorrow, as part of our vision to build a truly international culture of education, that will give students access to quality teaching worldwide," says Chris Chang, Pro Vice-Chancellor Global Engagement, University of Portsmouth, UK. "It is heartening to see our community of students benefit so much from the academic distinction that our partners from both Singapore and the United Kingdom are bringing to the classroom, to graduate as confident workers, ready to contribute to the nation's core infrastructural development, and able tap on a solid foundation which will open doors to help springboard their careers across the region," says Tin Latt, President of Chindwin College. 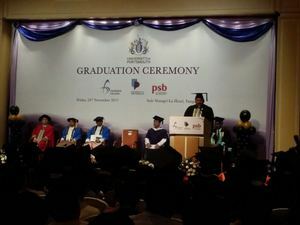 "We're proud to see the fruits of a successful transnational education network, through the close partnership of PSB Academy in Singapore, University of Portsmouth in the United Kingdom and Chindwin College in Myanmar, in developing the next generation of Myanmar's engineers," says Derrick Chiang, Chief Executive Officer of PSB Academy. "As Asia's Future Academy, we continue to integrate the very best of Singapore's capabilities as ASEAN's innovation hub, to develop human capital that will fuel the vast growth opportunities across Asia." Over 50 engineering students graduate today from University of Portsmouth’s degree programmes at Chindwin College Myanmar.